Wash chicken, pat dry and set aside. 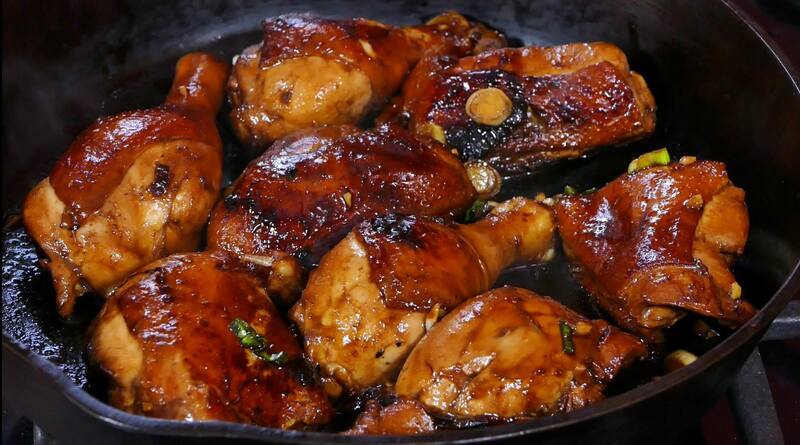 Make marinade: In a large bowl, combine balsamic vinegar, soy sauce, honey, brown mustard, garlic and green onions. Whisk to thoroughly combine. Reserve 1/4 cup marinade for basting chicken. Place chicken in a glass baking dish. Pour marinade over chicken and turn pieces to coat all sides. Cover and refrigerate for several hours or overnight. When ready to cook, heat grill or skillet. Cook chicken until internal temperature reaches 165 degrees or until chicken is thoroughly cooked. Baste chicken with reserved marinade as needed for added liquid and to give the chicken a glazed finish. Do not burn outside of chicken. If skin begins to burn, lower heat. Garnish with thin sliced green onions. Preheat oven to 450 degrees. Prepare potatoes by peeling and slicing in 1/8 inch discs. Place a steamer basket in a 2 quart pot or add enough water combined with baking soda to steam potatoes. Cook until fork tender but still firm. Drain the water and let them rest in the pot for one minute to allow excess moisture to evaporate. Place potatoes in a bowl with 3 tablespoons of olive oil, salt and pepper. Toss potatoes to coat and then shake bowl vigorously or stir the potatoes until a thick layer of mashed potato–like paste has built up on the potato slices. (This coating will allow potatoes to become crispy.) Transfer potatoes to a large rimmed baking sheet, spreading them out evenly. Cook for about 20 minutes or until deep golden brown. Carefully turn potatoes (a metal spatula will more easily release stuck potatoes.) Continue roasting until potatoes are browned and crisp all over. Sprinkle additional salt and pepper over potatoes if desired.